Amid the escalating riots engulfing Egypt in its entirety, Watani International went to press amid rallying by the secular streams in Egypt for nationwide demonstrations against the ruling Islamist regime which has proved a huge disappointment for the majority of Egyptians. More than 50 Egyptians lost their lives. The rioting was compounded by violence in the coastal town of Port Said, which all but eclipsed the nation-wide protests that have marked the 2nd anniversary of the 25 January Revolution, and which spread to the other major towns in the Suez Canal region: Ismailiya and Suez. Sunday evening, President Mursi declared a state of emergency and a curfew from 9:00pm to 6:00am in the Canal towns. The residents of the three Canal towns, however, defied the curfew outright. Come 9:00pm and they were all out in the streets, not merely demonstrating as might have been expected, but holding football games and dancing well into the dawn of the following day to the famous Canal melodies of simsimiya. The message was clear: “Nothing will break us”. Yet these towns saw demonstrations that were among the most violent in Egypt. Port Said, especially, was the scene of protests other than those marking opposition to the Islamist regime led by President Mursi. On Saturday 26 January the people of Port Said marched on Port Said prison to protest a court ruling that was understood to have sentenced 21 Port Saidis to death for their part in the killing of 74 fans of the Cairo al-Ahli Club during football rioting in town last February. 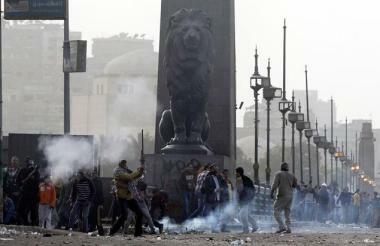 Deadly clashes occurred between the relatives of the defendants and the security forces; 31 lost their lives. The following day saw the collective funeral of the 31 Port Saidis turn violent: six lost their lives and more than 450 were injured. The army was deployed in town in an attempt to attain order and protect public facilities. A security source declared that shots had been fired from rooftops at the soldiers, and that there was “a foreign and local conspiracy to spread anarchy in the Suez Canal region”. The military announced they had fired no shots; and the security forces said they had not used tear gas to disperse the demonstrations, as had been claimed by news sites. This leaves open the question of who was firing gunshot or teargas, given that gunrunning on a huge scale has become rampant in Egypt since the 2011 Revolution. The 21 defendants, however, had not been ‘sentenced to death’. The documents concerning their charges were referred to the Grand Mufti Ali Gomaa [the Mufti is the person in charge of issuing fatwa, Islamic legal opinion, or pronouncing the Islamic legality on various issues] for him to give an informed opinion. The Mufti may decide that there is sufficient evidence to incriminate them and thus sentence them to death, or he may decide the evidence is not incriminating and accordingly return them to court for the judge to rule in their cases. The Mufti, for his part, has pledged he will study the documents rigorously and write his opinion on their charges. The misunderstanding arose from the fact that it is routine for Egyptian courts to obtain the Mufti##s approval—which he usually grants—in case a criminal is sentenced to death. But in the recent case, it was not so. The 21 are thus neither culprits nor, as Port Saidis claim, scapegoats. As lawyers Ahmed Negeida and Tumader Zaghloul told Watani, public pressure to see some defendants handed death sentences was too great for the judge to rule otherwise or even to adjourn the case, a move the Ahli fans had warned against and which they saw as procrastination on the part of the court. So the judge decided to refer the decision to the Mufti. It must be noted, however, that the 21 defendants are known outlaws; which is not to say they are guilty as charged. The Port Said case involves another 52 defendants who include senior Port Said security figures and officials of the Port Said al-Masry Club, the rival club to al-Ahli in the February 2012 football match. The court has said it will issue rulings concerning them on 9 March. Compounding the nationwide violence is the first-time participation of an Egyptian Black Bloc (BB) movement which, in apparent reference to the 1970s German anarchists, was launched through a Facebook campaign and quickly swelled into the thousands of members. It stormed public buildings, and attacked Islamist targets; and also declared its responsibility for various fires. Islamists retaliated with their own armed militias and their version of “White Bloc”. The Cairo embassies of the United States and the United Kingdom, both of which lie close to the revolutionary hub of Tahrir Square, suspended work on Sunday. On Tuesday, the public prosecutor Talaat Ibrahim ordered the arrest of all members of the BB, who then promptly closed down the Facebook page through which their movement had been formed. Other arrests were also taking place. Some 15 Port Saidis were caught and charged with attempting to break into Port Said prison, and nine were arrested and charged with setting ablaze two schools in the vicinity of Tahrir Square. They denied the charges, however, and claimed the police had picked them up as they walked on Qasr al-Aini Street heading to Tahrir. Hamdy al-Fakharani, a leading opposition figure and member of the Democratic Front Party, was caught and charged with inciting riots in the Delta town of Mehalla. In one unique incident, the demonstrators in and around Tahrir Square joined hands with the Police and helped to catch some 12 masked men who had broken into the Semiramis Hotel and robbed it. The demonstrators handed over the men and the stolen goods to the Police who in turn publicly thanked them for their positive role in catching the criminals. All in all, 28 were caught in this incident and prosecuted. On Wednesday, a 12-member delegation from the Shura (Consultative) Council, the upper house of Egypt’s Parliament, visited Port Said and Suez on a fact finding commission. The nationwide unrest has not been kind to the Copts. Several incidents of violence or injustice have occurred against the Copts in Beni Sweif, Fayoum, Assiut, and Nag Hammadi. Friday 25 January, the date which marked two years on the Revolution, saw a number of thugs attack a Church-owned house in the town of Beba in Beni Sweif some 140km south of Cairo, and began pulling it down, but the Church called the police which stopped them and returned the house to the Church. The thugs had attempted to seize the 770sq.m house on 13 December, and had also been stopped. But the unrest on the occasion of the 2nd anniversary of the 2011 Revolution encouraged the second assault, in an attempt by the thugs to blackmail the Church into paying them tribute. Anba Estafanos, Bishop of Fashn and Beba, refused to accept any compromise or pay off the thugs, and insisted that the diocese will not let go of so much as an inch of its property, and will offer no concessions or conciliation. Another Church-owned building in Fayoum some 100km southwest Cairo, however, was not so lucky. Islamists in the village of Fanous pulled it down to the ground a week before the anniversary of the Revolution and, to date, the culprits run free and the Church has not been given licence to rebuild. The build-up, the second anniversary of the Revolution saw two other incidents against Copts in Upper Egypt. In the village of Marashda in Nag Hammadi some 460km south of Cairo, the 60-year-old Copt Nader Attiya who was accused of molesting a four-year-old Muslim child was ordered by the village elders to leave the village, together with his entire family; even though the official medical investigation pronounced the girl untouched. The Muslim villagers had waged an attack against the Copts in Marashda on account of the molestation rumour, burning six Coptic-owned shops and three cars, and smashing the crosses off the village church. All the Muslims caught in the rioting were released. And in the village of Ashmoul in Dairut, Assiut, some 320km south of Cairo, Coptic-owned shops and businesses were attacked in the wake of demands by the Coptic villagers that they should be given quotas of flour, bread and butane cylinders equal to those distributed by the authorities to Muslims. Two pharmacies owned by Bassem George and Salib Girgis were ruined, as were a grocery store belonging to Magdy Aziz and a store owned by Mina Samy. Several Copts, among them Aziz and his son, were assaulted. A conciliation session held by the village elders and officials contained the matter, but the Copts got no compensation for their losses.